We live in a high-tech digital world. Outside of the classroom we all use devices such as mobile telephones, digital TV and radio, communications, portable music players, games consoles and so on in every aspect of our lives. But technology finds its way into other places too, places that you might not expect. Any time there is some intelligence in a product or system, be it in industry or in the home, you will find a technological device at its heart. Technological intelligence that is placed into a product or system in this way is called embedded control. GENIE is the name of our embedded control system for schools and colleges. Developed to be low-cost, educational and suitable for use by teachers and students with no prior knowledge of electronics or programming, GENIE is the ideal way to enhance your designing and making projects and extend the range of what you can achieve. Through a range of easily programmable components, boards and kits, GENIE makes it possible to create any kind of project you like, from toys that come to life and wearable fashion that lights up in the dark to industrial control and robotic systems that sense their environment... the only limit is your imagination! An essential part of the GENIE system is our suite of software, from the fully-featured Circuit Wizard 3 that combines electronics modelling, CAD/CAM and programming with a comprehensive library of ready-to-go classroom resources, to the free GENIE Programming Editor for those requiring less assistance. We know that embedding a control system within a larger product or prototype can be challenging, especially in courses where time is limited. Working out how to mount the electronic circuit and calculate the position of every switch, light or other off-board component that will be mounted to a panel is a very time-consuming and error-prone process involving either trial and error or wading through complex technical component datasheets. It is no wonder that many students run out of time to finish their projects. To resolve this, we have added a new range of powerful panel design tools and CAD/CAM features to our Circuit Wizard software. We see Circuit Wizard 3 as not just a new version, but as a new type of product altogether. Components within the software have the built-in intelligence to understand how they will be mounted to a flat panel, and Circuit Wizard 3 uses this intelligence to completely — and to a very high precision — automate the manufacturing process. And before you start thinking, "my existing CAD software can do that! ", think again. These aren't static drawings; they are fully dynamic objects that update in real time as your design evolves. Move components around and see the corresponding holes automatically update along with them. This is panel design done right. 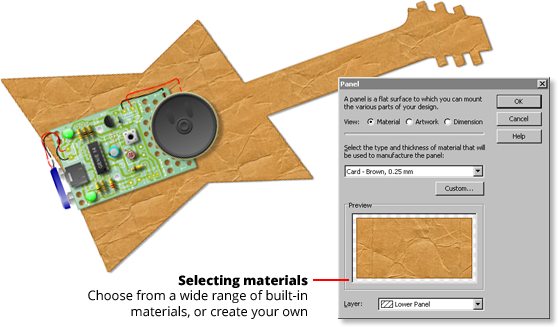 Projects involving several panels are possible too, and to help, Circuit Wizard 3 will work out the shape of all the necessary connecting tabs for you, with their dimensions determined from the thicknesses of the materials you have chosen. Speaking of materials, there is a wide range from which you can select, covering all the types of natural and manufactured materials that are typically used in school and college projects, including cards, wood, metals, polymers and composites. Fully realised on the screen through high-resolution textures, these materials will really help you develop both the functional and aesthetic aspects of your designs. You can even overlay your own artwork on top of the material for that final touch! No design software would of course be complete without a range of standard tools. Circuit Wizard 3's support for dimensioning, editing and scaling plus its ability to combine panel shapes together, import panel shapes from other software and add fillets and chamfers to smooth their corners, all help you achieve a higher quality outcome and a better looking portfolio. We have worked hard with Circuit Wizard 3 to really simplify the designing and making process, saving you precious time, which you can then use to to try out different ideas. It's a product that was truly built with iterative designing in mind.